There are many ways to brew a cup of coffee, but some methods are better at extracting the rich flavour of the beans better than others. While traditional drip coffee is made by pouring nearly-boiling water through ground coffee beans, cafetiere, or “French press” coffee, fully immerses the grounds in hot water before plunging the filter to separate the grounds from the liquid. The result is a richer, denser, more flavourful cup of coffee. Making coffee with a cafetiere isn’t as complicated as you might think. Read on for a bit of background on the device itself, along with some tips to help you make the perfect cup of cafetiere coffee. A cafetiere, or French press as it is often called, is a cylindrical coffee pot with a flat filter that is attached to a long handle on its lid. Coffee grounds are placed in the bottom of the pot, a filter is placed on top, and hot water is poured over the grounds. Because the grounds are immersed, the cafetiere extracts a great deal of flavour from the ground coffee beans, which is then transferred to the liquid after it is filtered. Although people have been brewing and drinking coffee since the 15th century, cafetieres have only been around since the 19th century. The earliest cafetieres, designed in the 1850s, were lacking a watertight seal, but this problem was solved in 1929 when an Italian inventor named Attilio Callimani patented a new type of coffee plunger with an improved grill and a mesh skirt to enhance filtration and prevent grounds from spilling into the liquid. 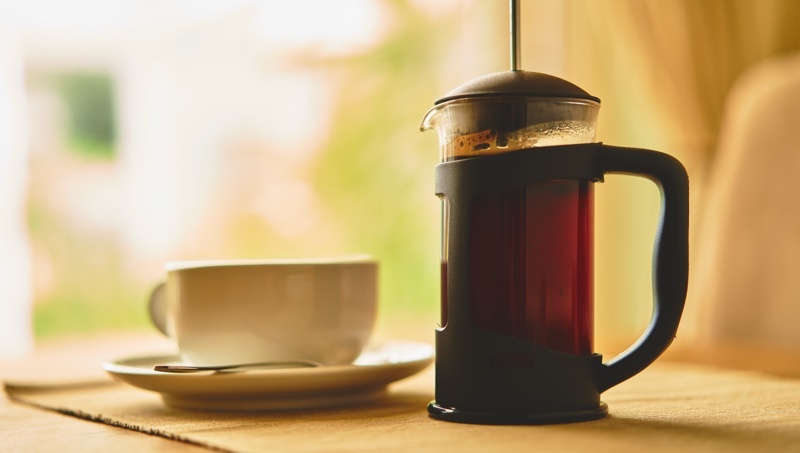 There are three main considerations when choosing a cafetiere. The first is knowing what size will suit your needs. Cafetieres are usually marked to show how many cups of coffee they brew at one time. If a smaller cafetiere brews a 125ml cup of coffee, that leaves enough room for milk or cream in a six-ounce cup. Larger options are also available, including six, eight, and twelve-cup models. Cafetieres come in a wide range of materials to suit any budget. Polycarbonate cafetieres are made from strong plastic, and unlikely to crack or break, but aren’t typically as luxurious or aesthetically-appealing as their pricier glass counterparts. Most cafetieres are offered in the traditional glass design, but there are also stainless steel and aluminum options for those that prefer higher thermal insulation over a clear view of their coffee as it brews. Lastly, there are several design factors to consider as you shop for your cafetiere. Many models have a main cylinder that is pre-built into the frame. Others have removable cylinders for easier cleaning and replacement if the glass gets broken. A great cup of coffee starts with choosing the right beans. There are dozens of options to choose from, but some lend themselves better to the cafetiere brewing process than others. To help narrow the field, you must first weigh your personal preferences for taste and caffeine content. If you’d like your coffee to contain higher amounts of caffeine, choose a light roast bean. For richer flavours, choose a darker bean. Light roasts tend to be sweeter and less bitter, while dark beans have a full, bold flavour. We have a great selection of coffee beans that you can choose from. Next, choose a bean that produces a very coarse ground. Unlike traditional grounds, cafetiere grounds should be closer to the consistency of rough sand than of powder. This will prevent grounds from slipping through the filtration process and into the liquid. Lastly, you should always use fresh beans as they lose their flavour quickly and impact the taste of your coffee. A good rule of thumb is to only buy enough beans at a time to last two weeks and to grind them immediately before brewing. After you’ve chosen your coffee beans, preheat your cafetiere by running it under warm water. This will reduce the risk of cracking or shattering if the glass is too cold when you begin the brewing process. Now, it’s time to grind your coffee beans. If you’re unsure how much to grind, follow the guide of one heaping tablespoon per cup of coffee. While you grind the beans, start boiling your water in a separate pot or teakettle. The temperature should be around 200 degrees Fahrenheit for the best results. Next, remove the lid from the cafetiere and pour your ground coffee into the bottom of the cylinder. Once you’ve replaced the filter over the grounds, pour the boiling water into the cylinder. You should use one cup of boiling water for each cup of coffee you wish to make. To integrate the coffee with the boiling water, lift the plunger and stir the grounds. Tip: keep the plunger in the upright position to ensure that the grounds continue to blend with the hot water. Set a timer for three or four minutes to allow the grounds to fully steep. When the timer is finished, press down slowly and steadily on the plunger to separate the water from the grinds. Be careful not to mix the grounds into the liquid or splash the coffee on yourself. To finish, pour the coffee into a mug and enjoy! If you prefer tea to coffee, you can also use your cafetiere to brew a great cup of tea. While tea bags already provide the same type of filtration as a cafetiere, you can also use loose-leaf tea and follow the above instructions, taking care not to mix the leaves into the liquid. You should also use a lighter touch when pressing the leaves so that you don’t release bitterness into the liquid. Experiment with your cafetiere, using different beans and combining flavours. With a little practice, you’ll be a cafetiere coffee master in no time.